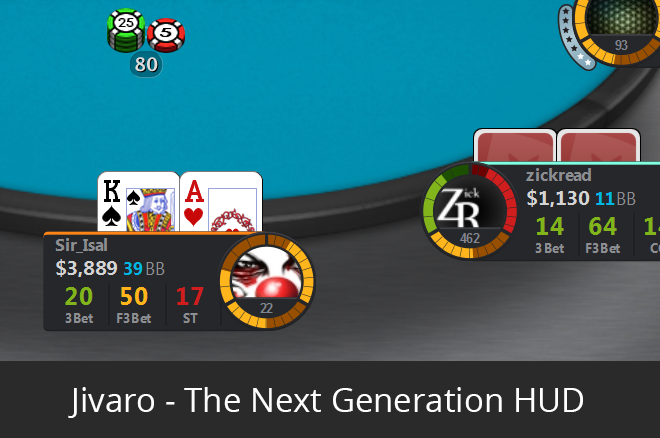 There is a new entry to the poker HUD market called Jivaro. Find out why it's taking the poker world by storm. Jivaro is unusually user friendly with its graphical indicators and zero configuration. Check it out. Many professional poker players are using Jivaro as they are playing multiple tables. Find out why here. There is a new entry to the poker heads-up display (HUD) market called Jivaro. For those that don't know what a poker HUD is, it's software that tracks your opponents while you play and then gives you statistics on their playing style. The idea is to provide you with information so that you can make better decisions in critical spots. Until now, poker HUDs have traditionally been used by experienced poker players only. Complexity and pricing has so far kept these tools out of the hands of regular poker players, but that might all be changing now with Jivaro. Jivaro is unusually user friendly with its graphical indicators and zero configuration, and it comes in two flavors depending upon your experience or requirements. Jivaro Basic is a completely free version which you can use for as long as you like and is designed for those that are either new to HUDs or those that only want a clean and simple HUD. Jivaro Premium, which was released just recently, is a paid upgrade and offers advanced statistics and features which experienced users of HUDs will appreciate. Among the unique premium features are positional awareness and a tournament command center. It should also be noted that Jivaro is the only HUD on the market which operates in real-time. What will strike you is just how easy Jivaro is to setup and use. The interface is intuitive and sharp and because it is so graphical you can very quickly see what type of poker player you are up against — this is why many professional poker players are using Jivaro as they are playing multiple tables and need a quick identification of their opponents. Graphical Indicators: Instead of simply displaying numbers, the Jivaro Core Indicators are represented as graphical meters surrounding each opponent’s avatar. This is to enable players to quickly identify player types visually, based on tightness and aggression. Real-time Operation: Jivaro records poker table data in real-time and is the only commercial HUD to do so. So the data players are dealing with is current to each hand and allows Jivaro to present data in a way not possible before. Premium Statistics Package: There are around 300 different statistics used in online poker, but Jivaro has handpicked those which are considered to be the most useful and present them only when needed. These include: Re-raise (3 Bet), Fold to 3 Bet, Continuation Bet (CBet), Fold to CBet, Steal, Fold to Steal, Cold Call, Bet, Fold to River Bet, Raise on Flop, Turn Aggression Frequency, and River Aggression Frequency. Street Specific Statistics: Jivaro Premium also gives information about opponents on each street which the player can view or check ahead by clicking on the new Street Selector. Positional Awareness: Jivaro Premium has been injected with some intelligence. It will filter out statistics which are not relevant and only show statistics which are potentially useful. So you can think of Jivaro as an assistant which will hand you a hammer when you need it and not the whole toolbox. Command Center: The Command Center collects information about each tournament a player is in and provides a comprehensive overview. Things such as tournament type, winnings, entrants, places paid, remaining players, and current position are some of the data displayed. Jivaro Premium is available for download from Jivaro.com for $5.99 a month, with limited-time $4.99 a month introductory pricing in August. For more information please visit www.jivaro.com. 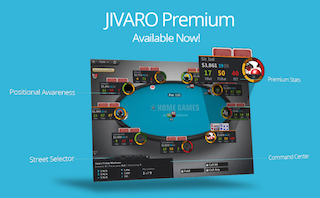 Jivaro is a refreshing entry into the HUD market with products for both new and experienced poker players. Its tight integration into the poker client is impressive and assures the software is never in your way and installation and usage is very, very easy. The Premium version offers some very useful and clever features. Pricing is reasonable, starting at zero for Basic and $5.99 a month for Premium. Overall a great product that users of all levels should check out.